FOUND! February 22, 2015 Update. 1:43 p.m. 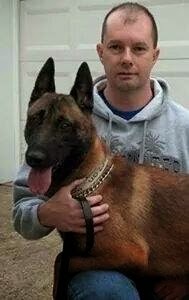 Officer Jerry Popp posted on facebook that his partner, K9 Officer Karson is with him on his way home. After nearly two months, Karson is safe, healthy, and heading home. Karson is a K9 Officer from Wilmington, Ohio (Clinton County) who cannot find his way home to his partner, Wilmington Police Officer Jerry Popp. On December 23, 2014, Karson took off from a boarding kennel in Clinton County, Ohio, and has been missing and on the road since. He may have an injured front leg. He is friendly (a sniffing dog, NOT at attack dog) and loves tennis balls. Look closely at his picture and you can see a distinctive scar (white-ish line) across his nose. Out in the elements, Karson continues to try to make his way home, and as late as this past week, Officer Popp has been able to confirm sightings in the general vicinity of Xenia, Ohio (Greene County), where Karson lives with Officer Popp and his family. Local residents are distributing flyers and traveling the roads along fields, woods, parks, and towns (binoculars at-the-ready) always on alert. And, Officer Popp is working with a professional search crew as well. If you see a dog you think might be Karson, please do not approach him. Call the Wilimington Police Dispatcher @ 937.382.3833 without hesitation. 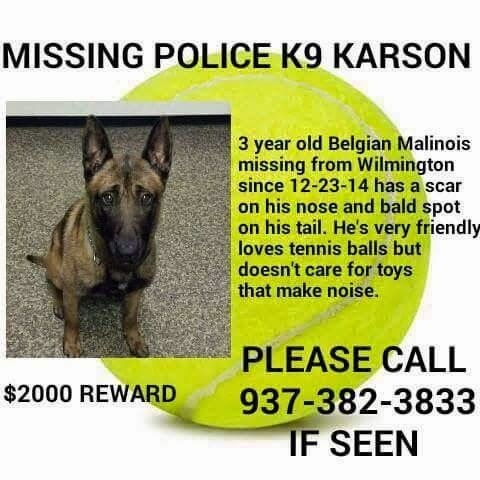 Folks, if you see a dog moving out there that you believe may be Karson, do not post it on Facebook, contact 911 immediately and speak to law enforcement. They have my number and can contact me directly and then I can contact you directly for detailed information. I am not monitoring Facebook and do not see posts of sightings. It's important for me to be able to speak on the phone to the witness directly. Thank you. What else can you do, especially if you don't live in the area? Include and keep Karson and Officer Popp in your thoughts and prayers. We all know how valuable collective concern can be for humans and animals. Dogs sense our energy and the collective power of moral support, for dog and human, carries great value. WHIO News Report from 12.23.14, with regular updates. Please note: The 1.17 sighting was confirmed to not be Karson. Xenia Gazette article on 1.14.15 by Nathan Pilling. Xenia Gazette article on 12.31.14 by Nathan Pilling. FOX45/ABC 22 report from 1.16.15 by Christian Hauser.